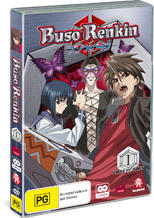 Unlike other animes I have come across recently, I have to confess Buso Renkin left me feeling a little cold. I attribute this to its comparative lack of humour and self-referencing. Or perhaps it is humour which goes over or around me. At any rate, it is difficult to get into the story or the characters. Highschool student Kazuki Muto is escorting his sister around his school—it’s her first day. By the end of the day, he has met a mysterious alchemist warrior Tokiko Tsumura and her wondrous weapon! She unveils the creepy, violent world of humonculi, which are vile brain parasites which take over one’s brain then body. Kazuki is brought back from the dead by Tokiko’s generosity and he repays this gesture by helping her defeat the people-eaters. The mystery is, of course, who (at the school?) is generating these monsters and why. Like other titles in Japanese animation, Buso Renkin sparkles with disjointed graphics and asides which become increasingly well-known to the viewer. Once you take this on board, you can sit down and enjoy the shows more thoroughly. I was especially reminded by this title, however, that my highschool years are increasingly long ago: it alienated me somewhat from what was going on. I am sure younger people would really be into the adventures of Kazuki and Tokiko as they hunt down the insidious evil behind the Papillion Mask! As with some other Madman releases, the English and Japanese soundtracks are both 2.0 (stereo, no bass). The image is 16:9 though and filled with lush colours and backgrounds. Features include commentaries and a behind-scenes featurette. I am sure fans don’t need my recommendation do rush out and get this—if they haven’t already!